SINGLE BRITISH PLAIN STEEL BALL-END STRINGS. 8 - 20. Many players know exactly which string gauges they require. 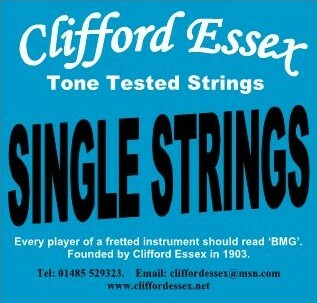 Choose from a wide range of high quality British fretted instrument strings. Most of our strings are available as singles, our phosphor bronze, nickel and chrome tape flats are wound on a hex steel core. All our strings are made of the finest materials and tone tested. We offer a 10% discount if you order 5 of the same string. Postage to UK Destinations : £1.00. Rest of World : £3.00. Postage rates apply for any amount of strings. Any postage over payment at the checkout for multiple string orders will be refunded. SINGLE GROUND NYLON TIE-ON STRINGS. SINGLE SILVER AND NICKEL PLATED ON NYLON TIE-ON STRINGS. .026" - .034". SINGLE SILVER PLATED ON NYLON TIE-ON STRINGS. .036" - .046". SINGLE NICKEL OR PHOSPHOR BRONZE ROUND WOUND LOOP-END STRINGS. 0.34" - 0.42"
SINGLE NICKEL OR PHOSPHOR BRONZE ROUND WOUND LOOP-END STRINGS. 0.44" - 0.55"
SINGLE PHOSPHOR OR NICKEL ROUND WOUND BALL-END STRINGS. 20 - 32. MADE IN BRITAIN. SINGLE NICKEL ROUND WOUND BALL-END STRINGS. 46 - 52. MADE IN BRITAIN. SINGLE PHOSPHOR BRONZE ROUND WOUND BALL-END STRINGS. 46 - 58. MADE IN BRITAIN.